Filta is presented with the Green Leaf Award for their cost-effective and eco-friendly solutions for businesses. Filta President, Jason Sayers, discusses environmental benefits with the crowd and Commisioner Stewart (right). 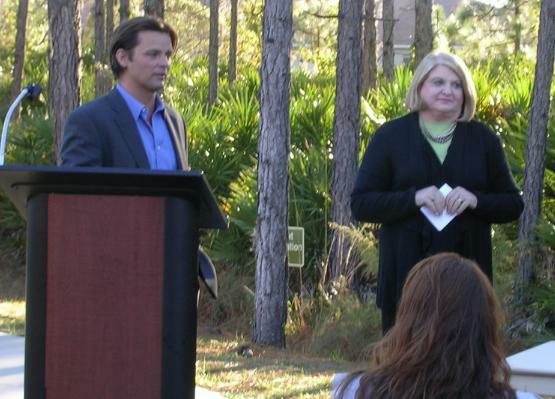 On December 1, the Filta Group was presented with the Green Leaf Award for Environmental Excellence by Orange County, FL Commissioner Linda Stewart. This award is to thank local individuals, groups, and businesses who work hard to protect the environment and demonstrate “green” practices. The Filta Group was awarded this honor because of their new and innovative way of operating to reduce consumption and pollution. The Filta Group’s FiltaFry service is a key reason why they were granted the Green Leaf Award. FiltaFry is a service offered by Filta that uses a mobile microfiltration unit to filter deep fryer oil in order to increase its life-span, thus helping companies significantly reduce their oil usage, which helps save money as well as the environment. So far, over a quarter of a billion pounds of oil has been filtered to date by Filta. This service also involves cleaning and maintaining the deep fryers to help them last longer, also helping to cut costs. After the oil has reached the end of its life, the FiltaBio service comes into play. Filta safely removes the waste oil, which is then purified and turned into biodiesel, which is safe and environmentally friendly. Orange County Commissioner Linda Stewart has helped with many green initiatives in Orlando such as insisting that the new Orlando Magic arena is “green”. The arena is expected to receive a nationally coveted award for energy conservation, making it and the downtown destinations for anyone interested in how green buildings can help sustain the environment and improve a business’ bottom line. Commissioner Linda Stewart deserves credit for insisting that the county support the arena only if the Magic built it that way. It uses 40 percent less water and saves $800,000 annually in utility and other costs. Filta and the Magic are helping Orlando take the steps towards greater sustainability.